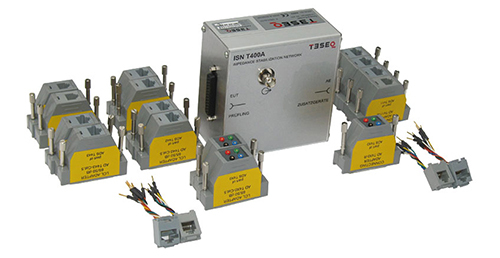 The ISN T4A is designed for measurements on one or two unscreened balanced pairs and consists of one basic network (ISN T400A) with D sub 25 connectors and special adapter sets. A set of adapters consists of LCL adapters to realize the longitudinal conversion loss (LCL)- requirements for the EUT-side in relation to the used cable category (cat. 3, cat. 5) and a connection adapter for the AE-side.